Truman High School's highly successful football coach, Eric Stiegel, resigned on Tuesday. A special education teacher at Carlson High School in Gibraltar, he'll likely look into other possibilities after coaching in Taylor for four seasons. The team finished 7-2 in the Downriver League and in a three-way tie for second place and went to the district finals in the playoffs before losing to DL champion Wyandotte. 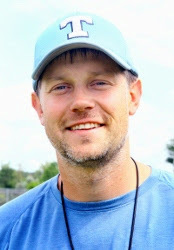 In 2012, Stiegel guided the Cougars to an 8-1 record and a three-way tie for the title in the DL. "The principal and I were shocked when Eric told us," said AD Loren Ristovski. "He did a great job with the program. He worked hard. I wish him nothing but success in the future." For more about Stiegel's departure, click here to read Samatha Elliott's story in The News-Herald Newspapers. 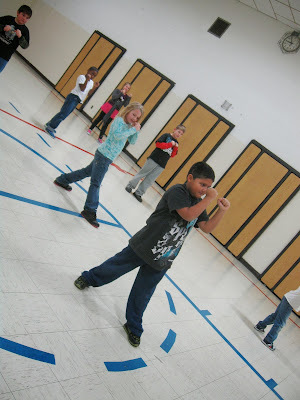 MCDOWELL ELEMENTARY SCHOOL: Mr. T's Health Club aims at both body and mind! Fit bodies can result in healthy minds! That's why Mr. Tomassion has started the McDowell Elementary School Health Club. 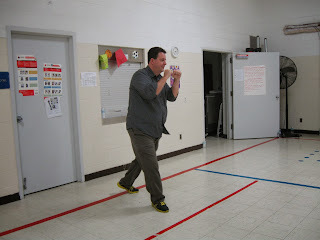 It targets children in the second through fifth grades. Fourth- and fifth-graders meet on Tuesdays, while second- and third-graders meet each Thursday. The club spends 15 minutes doing homework and reading. Then it's time for some fun. 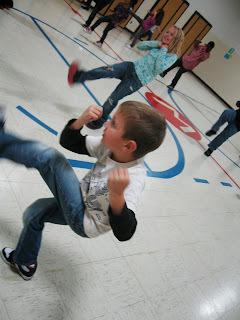 The club power walks for 20 minutes, then plays a game or practices kickboxing for another 20 minutes. A healthy snack is provided during each sessions. It's a great time to get some exercise, learn how to stay healthy and keep up with your studies. Hoover Middle School students do a Latin dance during a recent field trip to the Wayne County Community College District's Downriver Campus in Taylor. Beginning in December, JROTC students will visit Mrs. Kelly's fourth-grade classroom at Myers Elementary School three times per month in an effort to promote positive life skills. 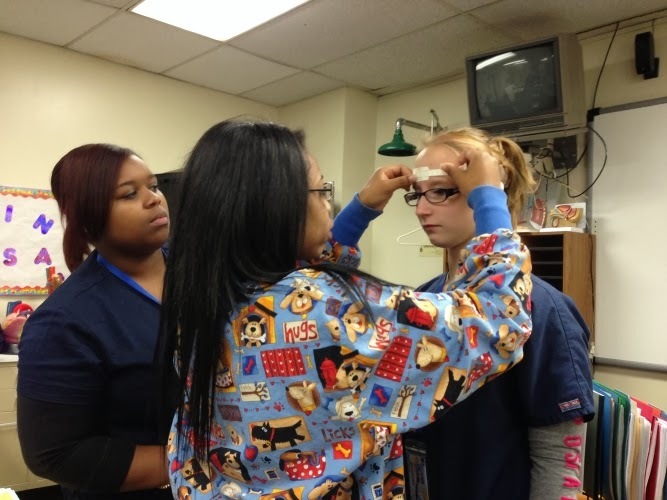 The JROTC students will begin visiting the class on Dec. 4. They will be in the classroom from 10:30-11:30 a.m. and will participate in math games and activities that promote life skills training. The Junior Reserve Officer Training Corps is the largest youth development program. 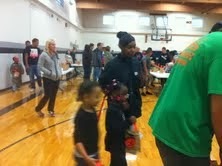 It is sponsored by the U.S. Armed Forces in high schools across the country, including Taylor. 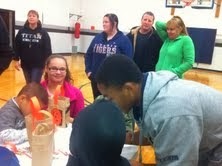 The Truman JROTC has been a long-time partner with Myers Elementary. The goal is to motivate young people to be better citizens while focusing on respect and discipline. 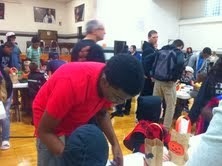 This mentoring program is part of that campaign. Just last year, Alyssa Domonkos became the first Kennedy High School student appointed to the United States Military Academy at West Point, N.Y. Domonkos was a stellar student at Kennedy and was a commandant for the JROTC, the highest attainable position in the JROTC program. "(Joining the) JROTC was one of the best decisions I've made in my life, so far," Domonkos said at the time of the West Point announcement. 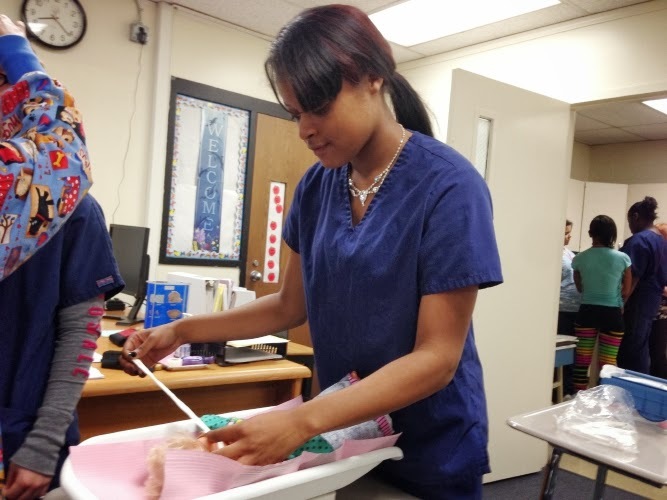 "Not only does the program teach leadership and responsibility, but it is also the reason why I know what I want to do with my life." 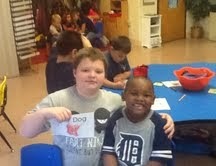 Mrs. Kelly's class hopes that some of that character and leadership development rubs off on them. 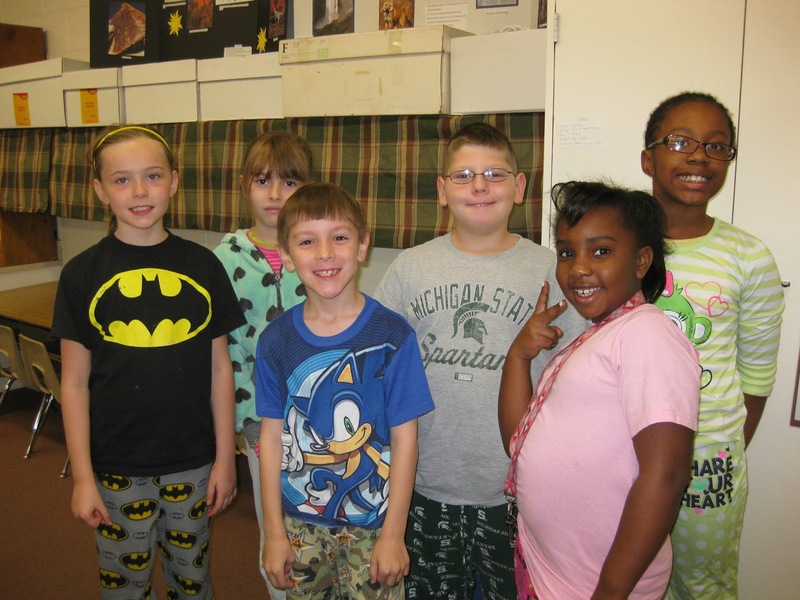 Recently the staff and pupils at Holland Elementary School in Taylor showed their support for the United States Armed Forces by dressing down and making donations to the GI Go Fund. The GI Go Fund is a nonprofit organization that assists in finding housing, education, jobs and medical coverage for veterans and enlisted military members. 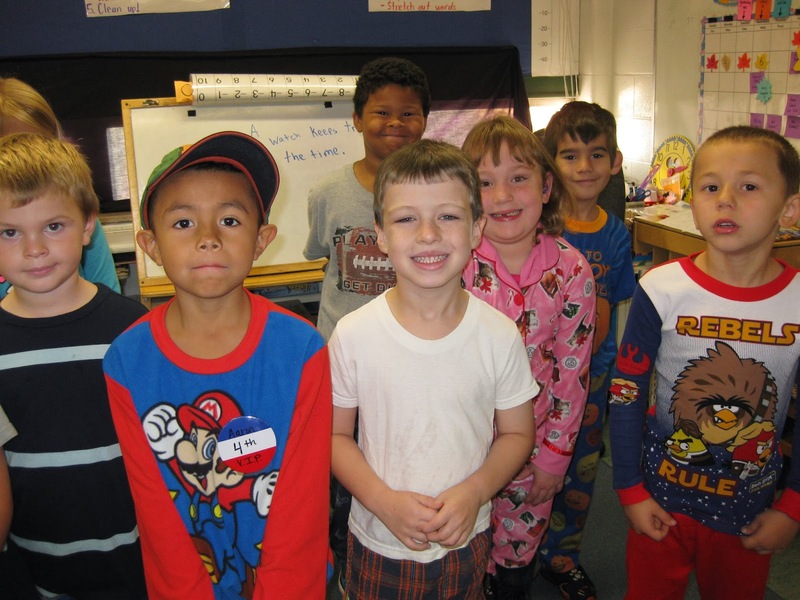 School staff donated $5 each and could either dress down or wear pajamas. The pupils donated $1 each and were able to wear their PJ's to school. And who says you have to wear slippers with your PJ's? 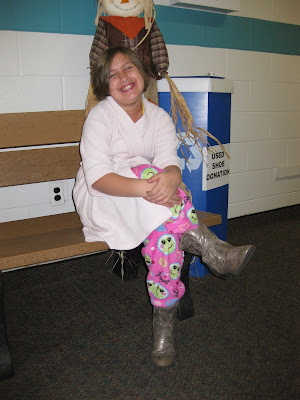 Abby wore cowboy boots! 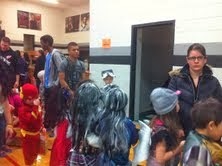 The school raised $255 to donate to the fun and had a fun -- and comfortable -- day at Holland. Students have been busy recently in the Taylor Career Center's "medical assisting" class, learning valuable skills that will translate easily into today's job market in the health field. 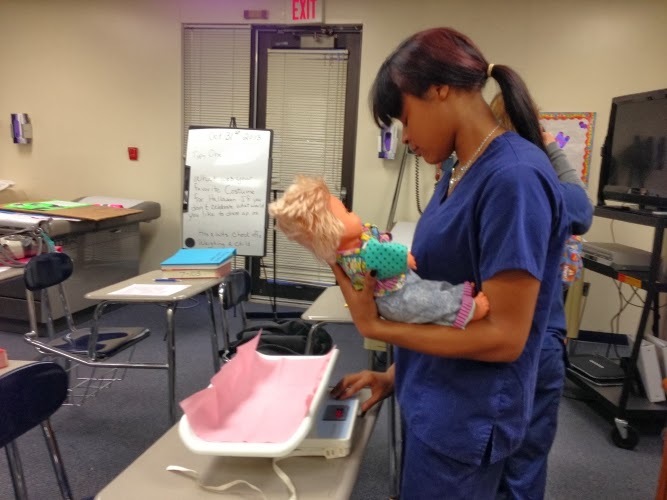 Students learn skills that be enable them to succeed in either a doctor's office or hospital setting. They practice skills necessary in laboratory settings, often using peers as "patients." 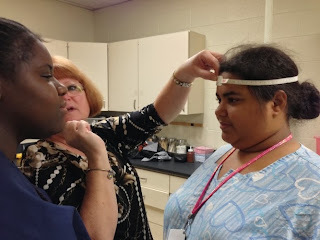 The class practices skills and are then checked on on competency. They dress the part, wearing scrubs, to present a professional atmosphere. Everyone is encouraged to work as team members. 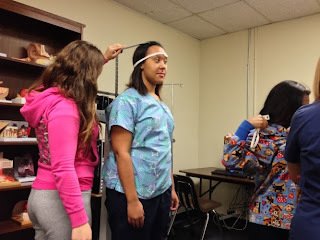 Some students in these photos are measuring and recording heights and weights. 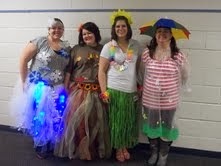 Never let it be said that West Middle School teachers don't keep tab of important issues. 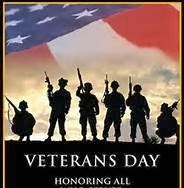 On Veterans Day, 32 members of the building staff participated in the GI Go Fund. Each member was allowed to wear jeans to work and donated $5 to the fund. West ended up donating $160 for veterans' charities. 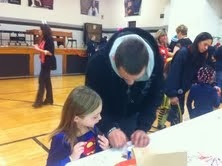 There's nothing like "Study Buddies" at Taylor Parks Elementary School. 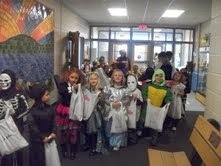 Mrs. Ambrosia's kindergarten class and Mrs. Augustyn's fourth-grade class meet once a week for 30 minutes. 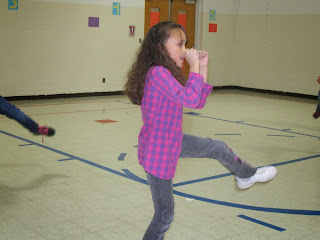 Their main goal is to increase confidence and fluency in reading. 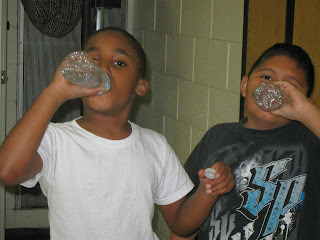 The children also work on math games, holiday projects and communication skills. 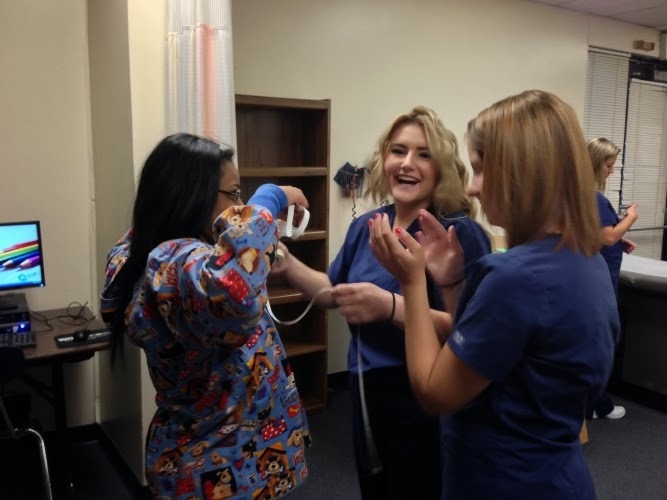 Taylor Parks loves its Study Buddies program! 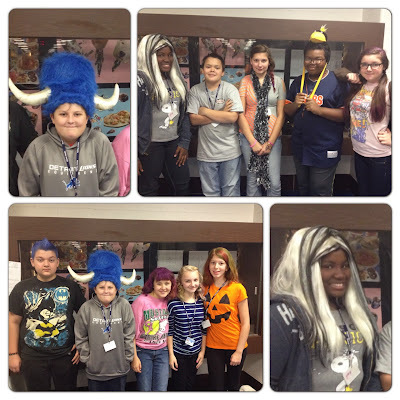 HOOVER MIDDLE SCHOOL: Halloween turns into Hoover Hair and Hat Day! 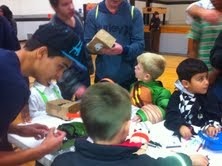 Halloween at Hoover Middle School involved plenty of crazy hats. Students could donate $1 and wear a crazy hat or hair piece all day. 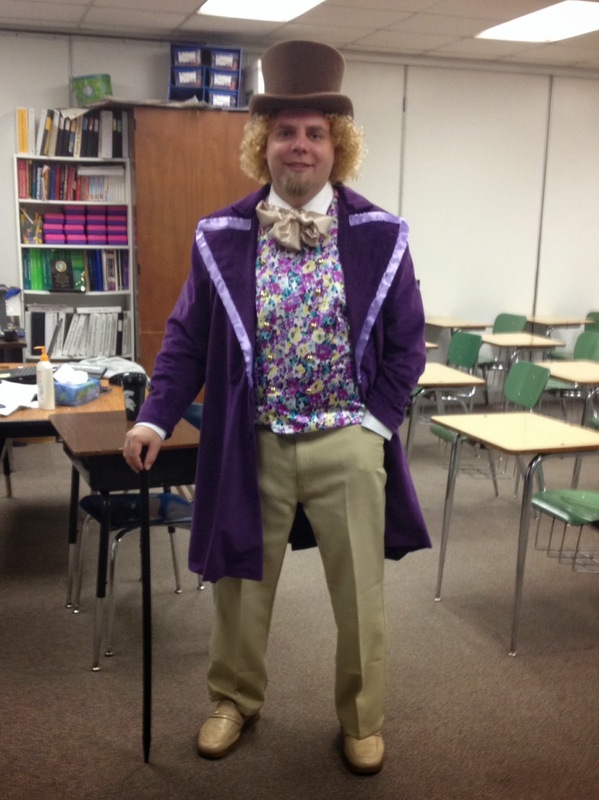 Mr. Altesleben even dressed up as Willy Wonka. 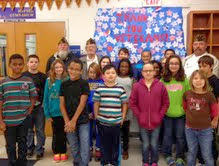 The Student Council at Kinyon Elementary School recently raised money for the Veterans Medical Center in Detroit. The Student Council sponsored “Hat Day.” Pupils brought in $1 to wear a hat for the day. 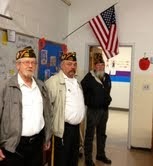 Veterans from the Taylor VFW came in to receive cards from Kinyon children. 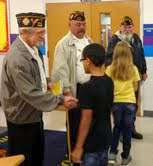 The veterans shared some information about the specifics of their service and the pupils were able to thank them for their service with a handshake. 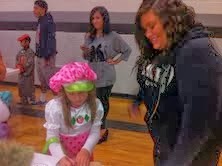 It was very touching, according to Kristi Mentzer, fifth-grade teacher at Kinyon and the sponsor of the Student Council. 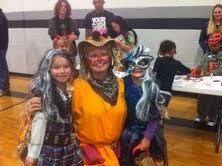 HOLLAND ELEMENTARY SCHOOL: Winn-Dixie comes alive! 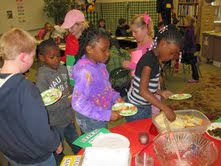 Winn-Dixie is a favorite novel to read in Mrs. Stewart's third-grade classes at Holland Elementary School. It is a heartwarming story of Opal, a lonely girl who befriends some interesting characters in her small town and falls in love with a scruffy dog she encounters at the Winn-Dixie. The dog has a mind of his own. 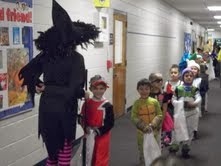 Mrs. Stewart's class was certainly surprised to find that their substitute teacher was Miss Gloria Dump, a character from the book! 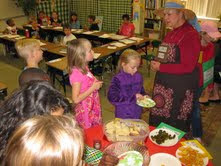 They walked into their classroom to find that it had been transformed into Miss Dump's backyard, complete with a tree, a picnic lunch and an assortment of friends from the book to share in the festivities. Otis was there, playing his fiddle for all to enjoy. 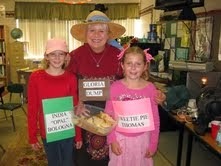 Sweetie Pie and Opal had fun visiting with the kids and enjoying egg salad sandwiches, sweet pickles, special punch and horehound candies. 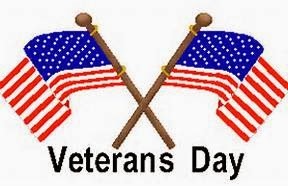 Children, staff and teachers at the Sixth Grade Academy got the week off to a nice start with a several special celebrations on Monday, which was Veterans Day. Jacob Furlong, stepson of Mr. Towe and a U.S. Marine for five years, led the school in the Pledge of Allegiance. 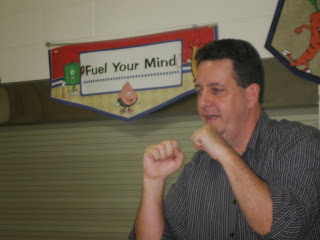 The school also recognized Mr. Sawmiller, a guest teacher in the building, who is also a veteran. 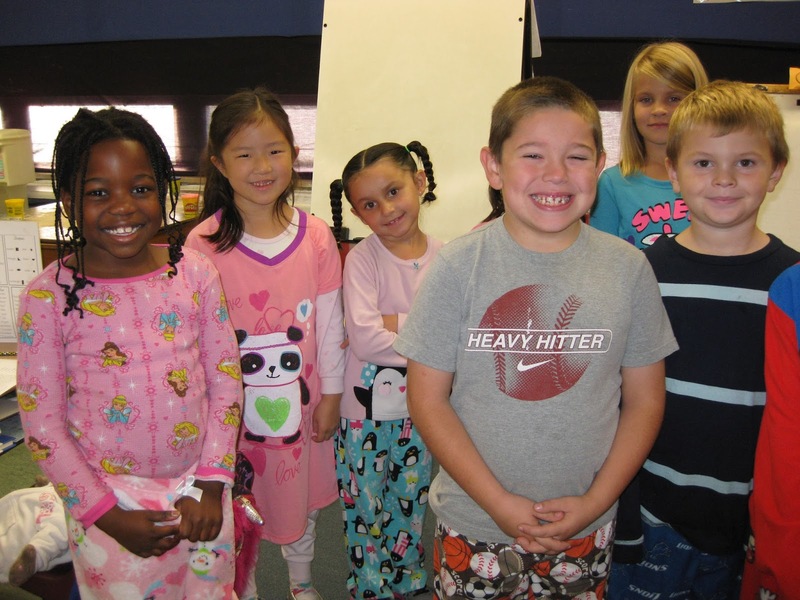 Five pupils were selected "Students of the Month." They were Chelsea Walkowski (Team Wizard), Walter Kirkpatrick (Team Extraordinaire), Evan Kaplani (Team Awesome Achiever), Robert O'Guin (Team Transformers) and David Retan (Front Office). All of the winners will enjoy a Subway meal for earning their honors. Mrs. Gherardi read to the children about why America celebrates Veterans Day. 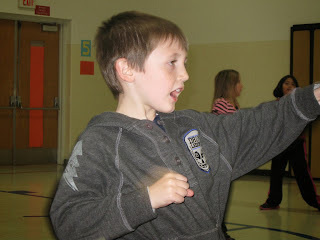 First-graders in Ms. Schoen's and Ms. Farkas' classes at Eureka Heights Elementary School recently wrote letters to military personnel stationed at the Warren Air Force Base in Wyoming. 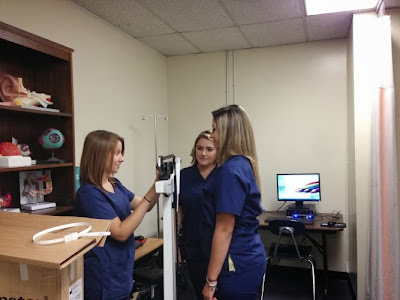 Above is a video greeting that the classes recorded. 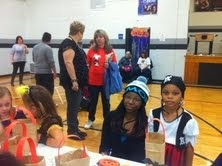 RANDALL ELEMENTARY SCHOOL: Spooktacular is a great success! 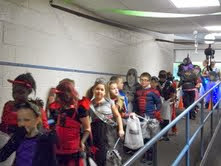 Randall Elementary School was able to host its annual “Spooktacular” on Halloween this year. 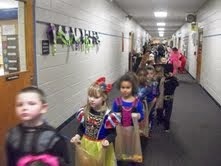 Students were able to go trick-or-treating from classroom to classroom before the beginning of their individual classroom celebrations. 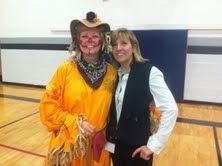 The event was hosted by the Student Council, which is headed by the Mrs. Mitroka and Mrs. Walters. 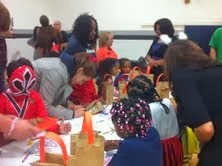 Donations were made to benefit the Taylor Reading Corps, which is a nonprofit organization in the city that recruits, trains and supervises adult reading volunteers to help Taylor School District lower elementary pupils. 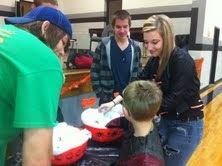 Thanks to the support of the students we were able to raise $422 for the TRC. 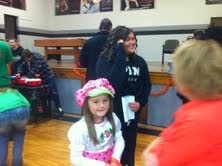 Some of the ladies from the TRC came to celebrate as well. 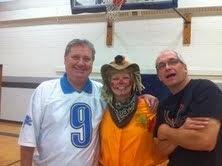 The staff and teachers would like to thank everyone for their participation. 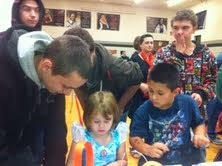 TITAN ALTERNATIVE HIGH SCHOOL: Holland children join in the fun! 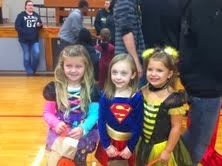 Each year, the kindergartners at Holland Elementary School go to the Titan Alternative High School for a Halloween party. This year was no different. 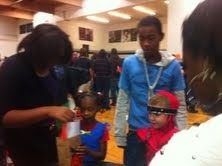 The Titan students help the children with coloring, decorating cookies, games and trick or treating. 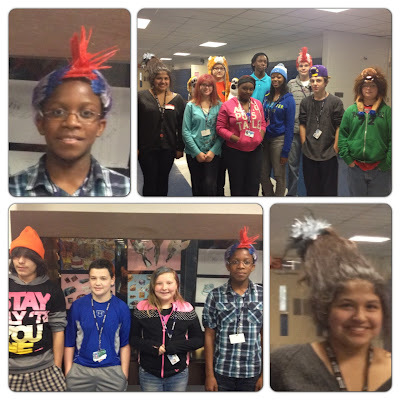 WEST MIDDLE SCHOOL: Uno Club meets today!